Today is Memorial Day in the United States. It is a day of gratitude and remembrance. We honor the many soldier who have lived and died to ensure our freedoms. As we live this day of remembrance – the longest war in our history continues. Is this war bringing us peace? War cannot produce peace any more that hate can produce love. Peace begets peace. 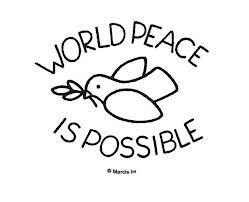 A world peopled with those who honor peace will bring peace. It is not a simple solution or an easy solution, but it is one we must consider before we practice the art of war into a state of being we do not want to face. I start with the individual. What can you do? You are only able to control your own actions. Today at noon wherever you are in the world – say these words – “Peace be with you and Peace be with the world.” – Let this become a meme that is heard around the world. Why? Because Peace begets Peace. This entry was posted in Uncategorized and tagged collective focus, compassion, healing, human-rights, love, Peace, Peace Initiative, politics, power of words, spiritual vibrations, War. Human-rights, World Peace, world revolution, world success. Bookmark the permalink.